I'm really looking forward to Nike Sportswear (NSW) bringing back the classic Air Flow's. Hypbeast got some exclusive pictures of the Old vs New pack (details below), which is dropping June 25th. The electric green/neon blue colorway is MEAN! The Nike Air Flow is an iconic shoe, conceptualized by Air Force 1 designer Bruce Kilgore and launched over 20 years ago (in 1989) in a neon colorway. Since then, brightly colored, running-inspired sneakers have become a norm in the footwear world. 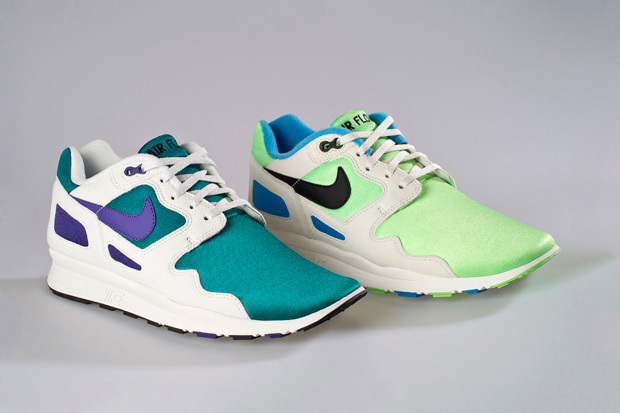 Nonetheless, the official announcement of the Nike Air Flow Old vs. New Pack is an exciting one. Encompassing two colorways – the classic electric green/neon blue as well as a lush teal/varsity purple – the Old vs. New Pack was designed by Nike to serve as a testament to the influence the Air Flow has had in terms of sneaker design over the past two decades. This ’80s-era pack will be available June 25 at select Nike dealers.